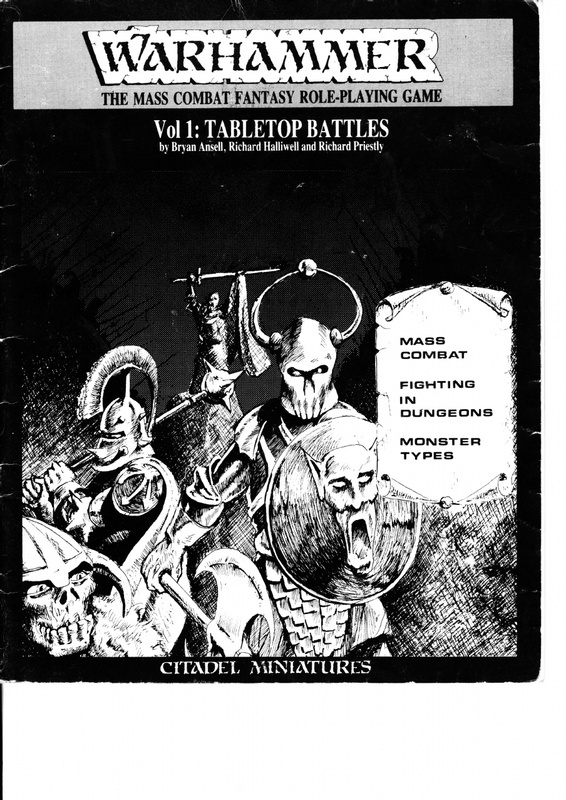 Today I have some time to spare and will take a closer look at the core of the Warhammer system as it was originally published: the Combat rules, the Volume 1 booklet of Tabletop Battles. with the drooping-horns helmet looking at? In the more recent editions combat (and magic) is all there is to Warhammer Fantasy, unless of course your playing WFRP (any edition)! second movement phase2nd Movement phase? If I had not read WH40K:Rogue Trader and 2nd and 3d edition WFB I would have been completely baffled by this. Move twice? what about march moves? can I march twice too? rout phase (currently part of the movement phase as "compulsory movement"
Nothing much has changed though when you look at the basic rules. Things have been tidied up a bit, streamlined and in some cases simplified. not always for the best, but the majority of changes after 1st edition do improve the game. In the original game, movement was, as it is today, measured in inches. And fractions of inches. Did you know that Elves originally moved 4.5 inches? and Dwarfs 3.5? And we also hit our first mystery in the rules right at the first page describing movement: armour encumbrance! Nowadays armour encumbrance is pretty clear cut. If you have heavy armour and a shield, you lose one point of movement. In originalhammer it just says that all "armoured" creatures except Dwarfs walk one inch slower. Nowhere in the 3 books is explained what kind of armour slows you down only that Mithril armour does not. So chain mail (light armour) appears to be just as cumbersome as Plate armour (heavy armour), and shields do not seem to factor into the equation. There is no marching (something only thought up for 4th edition) because players get another movement phase at the end of their turn, the reserves phase. Difficult ground and crossing obstacles appear at first glance to be similar, but are not. The former counts each inch crossed as 2 inches and the latter halves the crossing model's movement... which make me flinch due to the half-inches used in some profiles. wheeling, turning, extending frontage, Charging, flee-as-charge-reaction and stand and shoot are present in 1st edition, but more awesomely, Counter-Charging and interpenetration are in too! Oddly enough, after the chapter of movement, we get a chapter on Psychology, which in my later editions experience was usually somewhere in the back-half of the rulebook among the "advanced" rules. It makes sense though to put Psychology close to movement, as in Originalhammer (and in modernhammer too), most psychological effects affect movement. Then we get to the all important chapter of Morale. oddly enough, no one has yet been shot at or hacked with an axe, but we are given the rules for troop morale and courage right before the chapters detailing that stuff. Oh wait... the original warhammer Morale save is what we now call: the Panic Test (i.e. 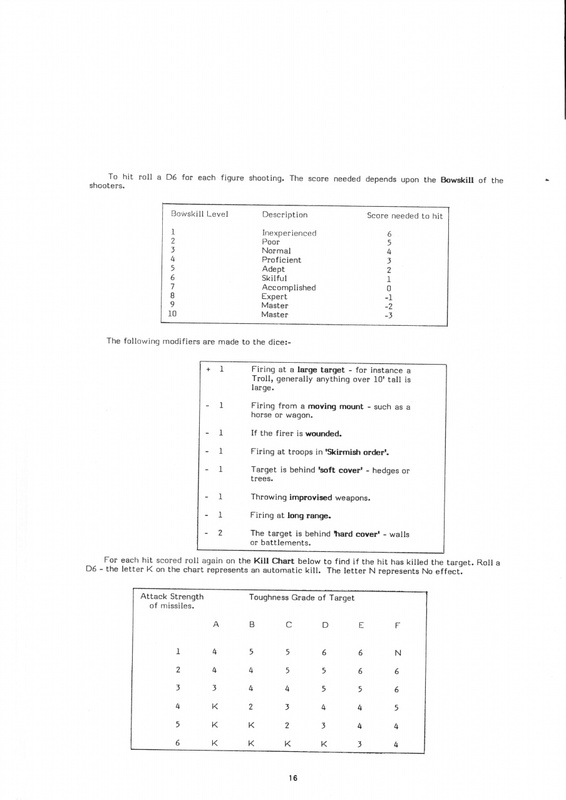 Leadership-test for casualties by shooting, units breaking/fleeing nearby and slain generals). 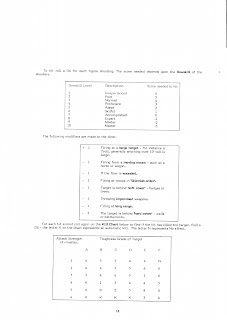 In originalhammer, Morale was tested on with a d6 roll, modified by penalties and bonuses requiring a score of 3 or better to "pass a morale save". The rules for morale are the first major "hey that's different" moment for me. Not only is the "panic-test" handled differently, the effect of a failed test is completely alien to my 5th edition-trained brain too! The results are scaled! Rolling a 0 or less for the test (due to the mentioned penalties, this is possible) a unit immediately routs and behaves much like any fleeing unit would do in later editions. rallying being an option... but again its a bit different in that it must double move (charge-rate sayeth the rules) in each player's Rout Phase. getting a 1 results in your unit having to 'just' retreat for two turns. No further explanation is given on that. I guess you'd just be obligated to have your unit turn and move away for 2 movement phases? scoring a 2 gives you a choice to either 'halt' or retreat for two turns, no explanation on this either. A smart GM would probably be able to judge what is the "realistic' option based on the situation in which the morale test was failed. It also treats multi-wound individuals a bit harsher, requiring a morale test for each wound suffered and inflicting a penalty of -1 to the roll for each wound suffered. Now, that could put pay to all the Super-characters if you could make it into an 8th edition house rule! Look at the picture to the side. What do you notice? Then we get weird again, Toughness not only being 1 point lower (like strength), but also measured in Letters! Why? what wondrous thinking might have led to that? Classic Hex-and-Counter Wargames perchance, where units were given a troop quality based on alphabetical order? In this case, Toughness A= toughness 1 and toughness 10 (or should that be 'J') is off the map. Then we have armour saves... back on home ground, nothing much changed but for what names are given to types of armour. In Originalhammer Light armour is called Chainmail, Heavy armour is named Plate armour and a 3d rank of armour goes by the name of "Mithric armour". Obviously inspired on Tolkien's Mithril, which 4th edition was cool enough to split into Ithilmar for Elves and Gromril for Dwarfs. Saving throws are as they are to this day, each grade of armour giving 1 'pip' on a d6 for a saving throw, high numbers good, low numbers bad. The armour save modifiers for strength, high strength attacks reducing armour saves, also originate in the original. However, whereas all (or most) creature's strengths are one lower than from 2nd edition onwards, the armour save modifiers did in fact start at S4! How about that? As this post is getting quite longer than I expected before starting, I will end it hereabouts. In the next post, we continue with the first nifty Advanced Rule and I hope to get through the full extend of the close combat rules. The post thereafter will include the remainder of Volume 1. So, Originalhammer, a lot seems familiar and yet, a lot is not. thanks for the compliment! 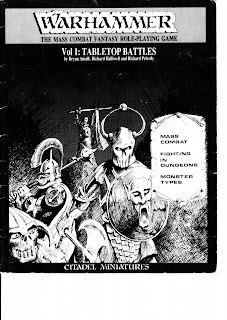 do you have a blog about WFRP 1st ed.? I have played/GMed that system a lot, though did not use the original setting. Still like it, and 1sthammer's 3d volume (characters) is the genesis of WFRP (so watch out for those posts when I make 'em) ;).